Roughly two decades ago, large integrated manufacturers developed the concept of vendor alignment—orienting vendor capacity, capability and performance criteria to the needs of the purchaser. This represented the first iteration of a process leading to a more focused, qualified and capable vendor base. Later, the concept was extended to the process of strategic sourcing—taking the benefits of vendor alignment and extending sourcing decisions to include material considerations, freight considerations, capacity analysis and a more directed sourcing process. The data revolution had made it to manufacturing. 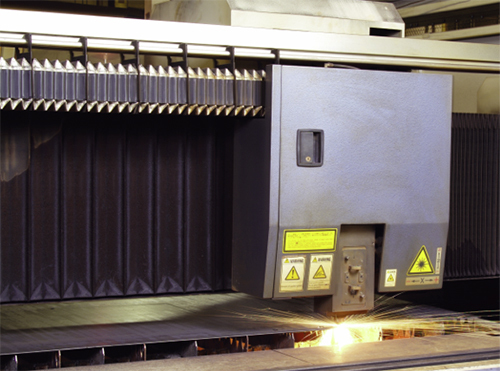 This laser cutter at Laser Precision LLC fabricates mostly mild steel, along with some aluminum and stainless, ultimately producing parts and assemblies for construction and mining equipment at a 130,000-sq.-ft. plant in Libertyville, IL. Since 2005, Laser Precision has increasingly used data to drive its operations, speeding delivery and boosting quality to world-class levels. Today, demands are greater and the requirement for agility has grown exponentially. Furthermore, vendor bases have been reduced, part counts have increased, and specific elements of supply and coordination have exploded. Manufacturers who have attempted to manage this change using conventional business practices have seen performance suffer, costs escalate and customer dissatisfaction increase. This is due primarily to the absence of a mechanism to accept, interpret, understand and deploy critical demand elements throughout the value stream. Conversely, those vendors who have embraced this new environment and developed sophisticated tools to adapt to a volatile and data-rich value stream are thriving. In short, manufacturers who have synchronized their goals, processes, capacity and activities with customer requirements have seen dramatic increases in performance, reductions in labor costs, increases in throughput, and are enjoying the benefits of peak performance while minimizing cost. So it is with Laser Precision LLC. The Libertyville, IL, fabricator of sheet and plate for a variety of industries counts 80 employees in a 130,000-sq. ft. manufacturing facility. Founded in 1994, Laser Precision does more than just laser cutting, with capabilities that include press-brake forming, CNC machining, turret punching, welding and assembly, and powder coating and other finishing processes. More than 90 percent of worked material is mild steel, with the balance aluminum and stainless steel. 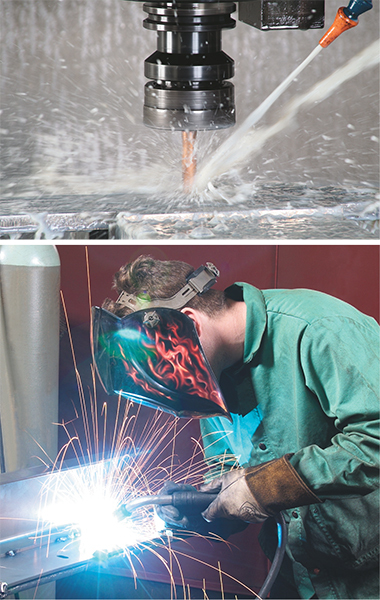 More than just a laser-cutting shop, Laser Precision performs CNC machining, welding, press-brake forming, turret punching, assembly, and powder coating and other finishing. Automated data gathering and processing allows for scheduling and demand changes on the fly, boosting the productivity of all of these processes. Laser Precision has pioneered big-data use among top-tier suppliers in manufacturing and after 11 years of refining the process, has impressive stats to share. The company has driven on-time shipping to 99.92 percent while improving PPM-defect performance to under 115 across 6000 distinct part numbers. As the numbers show, the ability to accurately and cost-effectively respond to demand changes has increased exponentially for the company. Laser Precision’s big-data journey began in 2005 when the company realized that business as usual wouldn’t cut it. Jeff Adams concluded that the future of his company would rest on incorporating information processing, and he set out to partner with a supplier of enterprise-resource software willing to implement Laser Precision’s ideas. From where Laser Precision sits, there are three value-chain levels to its value stream to harness: the customer or OEM; the direct supplier, which is Laser Precision; and vendors that supply outsourcing operations for Laser Precision. In seeking to synchronize sourcing, “we have been trying to seamlessly integrate our entire value stream, so that at the end of the day we can streamline the sourcing process and mitigate costs by letting intelligent systems manage tasks automatically,” Cameron Adams explains. Laser Precision has aptly dubbed this process Synchronized Sourcing, and describes it as a comprehensive ecosystem that hardcodes into the vendor’s data infrastructure all elements of supply and coordination to ensure a successful outcome. What does that mean? In practice, the system automatically and continually monitors and synchronizes the value stream based on customer-demand requirements. All elements of supply are automatically and continually monitored, including available machine capacity, labor capacity, material requirements, material yield, quality expectations, packaging requirements and freight management. Customer-demand schedules are updated electronically, and demand satisfaction is accomplished through a complex algorithm that schedules and manages the entire value stream without human intervention—the platform requires no schedulers, no expediters and no material planners, as intelligent systems perform these functions automatically. As many as 5000 electronic order changes—the company has received this many changes in a single day, according to Adams—can be processed, and production schedules modified to meet the new requirements in less than 30 min., without human intervention. With Synchronized Sourcing, all aspects of demand are planned, coordinated and synchronized: Raw material scheduled, requirements deployed to sub-vendors, capacity analysis conducted, work orders prioritized and scheduled, machinery programmed and control plans electronically deployed. At Laser Precision, factory schedules are updated and reprioritized every 90 sec. while production capacity is electronically monitored in real time. Constraints, conflicts and collaborative elements route immediately to management through a series of electronic control systems that alert personnel to exceptions in the manufacturing process. “Every day we receive schedule changes from customers,” explains Adams, “and our system imports those changes and then reschedules and reprioritizes the facility within 30 min. Other companies may have entire staffs to handle this full-time. To implement the data-driven process, Laser Precision had to earn buy-in from its customers, outsourcing vendors and its own workforce. Vendor alignment was a concerted effort to identify suppliers based on their capabilities and capacities, according to Adams. Even with that level of buy-in, internal buy-in can be the most challenging component of any business-process evolution. To date, the system has reduced part costs, assured on-time supply, optimized material yields and enhanced quality performance, according to Adams, while waste, in the form of non-value-added activities, has been eliminated.